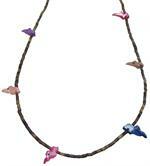 Item #IGM-HS-BRD-4-26: 26” Heshi Shell necklace with Mother Of Pearl Birds. 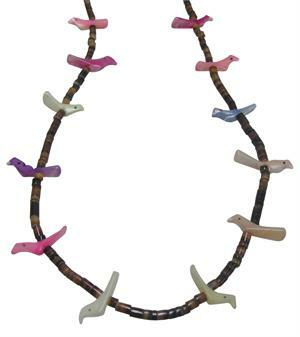 Item #IGM-HS-BRD-20: 20"-21” Heshi Shell necklace with Mother Of Pearl Birds. Item #IGM-HS-EL-20: 20"-22” Heshi Shell necklace with Mother Of Pearl Elephants. 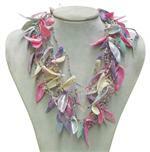 Item #IGM-DY-SHL-2: Approximately 23” long 8-strand Necklace of Dyed Shells. Item #TM-54367E-SLPAU: Sterling Silver Earrings with 18x25mm oval Abalone Shell; Shepherd's hooks. Item #SC-EPFA-0656-M1: Rhodium-plated Sterling Silver Earrings with inlaid Mother of Pearl and two 6x8mm oval Amethyst of 2.21 Cts. TW; Post backs. Item #SC-EPFA-0801-M1: Rhodium-plated Sterling Silver Earrings with inlaid Mother of Pearl and two 3.5mm square Amethyst of .60 Cts. TW; Post backs. 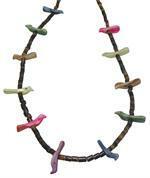 Item #SC-BRBP-0035: 1" long 14Kt. Yellow Gold Bee Brooch with 7x9mm oval Black Onyx & Mother of Pearl Cab and two round Diamond Eyes of .01 cts. TW. Item #SC-BRTO-36: Approximately 3/4"x3/4" 14Kt. Yellow Gold Ladybug Brooch with Golden Tiger's Eye, Inlaid Mother of Pearl and four round Diamonds of .03 cts. TW set in White Gold. Item #SC-ERLO-599: 14Kt. Yellow Gold Earrings with four Lapis Lazuli Cabs inlaid with twelve Mother of Pearl flat top Cabs and .11 cts. TW of round Diamonds (four Eyes bezel set in White Gold and eight pavéd in White Gold); Post and clip backs. Item #SC-ERLP-586: 14Kt. Yellow Gold Earrings with four Lapis Lazuli Cabs inlaid with four Mother of Pearl flat top Cabs, Ruby Eyes of .06 cts. TW and round Diamonds of .04 cts. TW set in White Gold; Post backs. Item #IGM-P-LLB-8: Pink/Lavender Natural Shell stretch bracelet with 1.5"-2" long shells; fits 7"-8" wrist. Item #SC-ERMP-0368: 14Kt. Gold Earrings with two 12mm bezel set round Mabe Pearls, Black Onyx & White Mother of Pearl Trim, two 2mm bezel set round Blue Sapphire Cabs, & sixteen round Diamonds of .08 cts. TW bezel set in White Gold. Item #17046: 18Kt. Rose Gold lady's ring with 10mm cushion Mother of Pearl and Quartz doublet and eight 2mm round Peridots by Zoccai Company in Italy. Size 5 3/4. Item #TBM-PD8-031386: Adjustable 15 1/4"-16 1/2" 18Kt. Rose Gold necklace with 16mm round Mother of Pearl and Quartz doublet, twenty-four round Pink Sapphires and fifteen round Diamonds of .33 Cts. TW by Zoccai Company in Italy. Item #17049: 18Kt. Rose Gold Ring with prong set 16mm round Mother of Pearl and Quartz Doublet & Pink Sapphires and round Diamonds of .66 Cts. TW by Zoccai Company in Italy; Size 7. Item #TG-GAM: 14Kt. Yellow Gold cuff links with two 15mm round Antique Mother of Pearl gambling counters; 7.72 grams TW. Item #SC-CLBP-467: 14Kt. Yellow Gold Ladybug Cuff Links with inlaid Mother of Pearl, inlaid Black Onyx spots, two bezel set round Ruby Eyes of .07 cts. TW and six round Diamonds of .04 cts. TW set in White Gold. Item #SC-ERBP-586: 14Kt. Yellow Gold Ladybug Earrings with inlaid Mother of Pearl, inlaid Black Onyx spots, round Ruby Eyes of .07 cts. TW and six round Diamonds of .04 cts. TW set in White Gold; Post backs. Item #MX: Approximately 3/4" long 14Kt. Yellow Gold Turtle & Snail Earrings with Red Jasper, inlaid Mother of Pearl & four round Diamonds set in Whtie Gold; Post backs. Item #SC-ERRO-586: 14Kt. Yellow Gold Ladybug Earrings with Red Jasper, inlaid Mother of Pearl, four Ruby Eyes of .06 cts. TW & six round Diamonds of .04 cts. TW. Item #SC-BRAC-33: 14Kt. Yellow Gold Brooch with 13x18mm Oval Shell Cameo. Item #SC-BRAC-32: 14Kt. Yellow Gold Brooch with 13x18mm Oval Shell Cameo. Item #ELY-0811-VM-320: Sterling Silver pendant with 32x35mm fancy shape Variscite (Australia) cab and 10x16mm marquise Mother of Pearl Cab., 27.03 grams TW.